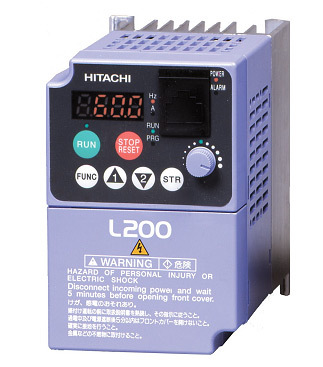 HITACHI COMPACT, FULL-FEATURED NEW GENERATION MICRO VARIABLE SPEED DRIVES : News Releases : Hitachi America, Ltd.
TARRYTOWN, NY, December 1, 2004 -- Hitachi America, Ltd., Power and Industrial Division, today announced the new full-featured L200 Series micro variable speed drives. The L200 features a variety of new and enhanced functions, providing unparalleled simplicity and flexibility. They include side-by-side mounting capability, built-in timing logic and analog input math (PLC) functions, DIP-switch hand-off-ratio and RS485 Modbus RTU communication interface. An optional NEMA4X keypad kit will allow flexible and cost-effective panel mounting. The L200 is empowered with cutting-edge functions yet is easy-to-install, easy-to-use, and easy-to-maintain. The L200 series delivers a modern, global variable frequency drive solution.